Just a quick note to wish all of you a joyous Christmas. Susan joins me in wishing all of you the happiest of days with your friends and families today. Hopefully, none of you found any lumps of coal in your stockings this morning, and hopefully none of you received a visit from Krampus. Thank you for taking time out of your busy days to visit this blog. I appreciate all of you. Late last week, I learned about the Civil War Trust’s excellent new program to honor our veterans, which I want to share with you. WASHINGTON, D.C. — The Civil War Trust, the nation’s largest nonprofit battlefield preservation organization, is proud to announce a new national campaign to honor American veterans, past and present. The multi-media campaign will recognize the tremendous sacrifices made by our men and women in uniform, and includes an online petition — http://www.ipetitions.com/petition/honor-our-soldiers — through which concerned Americans can show their support for historic battlefield preservation. 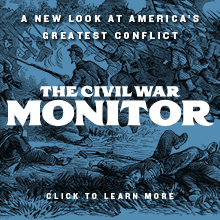 “We see Civil War battlefields as living memorials to the courage and service of all of America’s military veterans,” remarked Civil War Trust President James Lighthizer. “We share an incalculable debt to the many soldiers, sailors and airmen who have endured hardships and sacrificed for our freedom. By preserving these battlefields, we celebrate their memory and honor their legacy. The new “Honor Our Soldiers” campaign is intended to generate awareness about the acute plight of Civil War and other battlefields on U.S. soil. Many of these historic shrines to our nation’s military have already been lost, and even more remain at risk of being destroyed beneath a bulldozer’s blade. As an example, nearly 20 percent of our nation’s Civil War battlefields have already been lost to development — denied forever to future generations. The “Honor Our Soldiers” campaign seeks to rally support for protecting those hallowed grounds that remain. To honor our soldiers — both past and present — PLEASE SIGN the petition to show your support for the preservation of the hallowed battlegrounds on which Americans have fought and died. Go to http://www.ipetitions.com/petition/honor-our-soldiers/ or visit the website at www.HonorOurSoldiers.org. The Civil War Trust is the largest nonprofit battlefield preservation organization in the United States. Its mission is to preserve our nation’s endangered Civil War battlefields and to promote appreciation of these hallowed grounds. To date, the Trust has preserved more than 36,000 acres of battlefield land in 20 states. 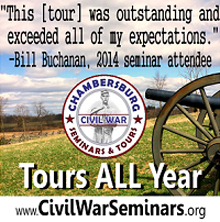 Learn more at www.civilwar.org, the home of the Civil War sesquicentennial. This is a worthy effort to honor our veterans. To see the Facebook page for Honor Our Soldiers, click here. Please take a moment to check it out, and please support this worthy new project by our friends at the Trust. The following article appeared in the December 19 edition of the Culpeper Star-Exponent. It demonstrates beyond any doubt that the Brandy Station Foundation is no longer a battlefield preservation organization. Posted: Thursday, December 19, 2013 12:15 am | Updated: 12:39 pm, Thu Dec 19, 2013. Every inch of the Graffiti House in Brandy Station is historic — even the bathroom. During a recent study by architectural conservator Chris Mills, new Civil War-era artwork was found in the circa 1858 structure believed to have been used as a hospital by Confederate and Union forces during the war. For unknown reasons, patrons decided to mark up the walls with signatures, drawings and anything else that crossed their minds. Mills ’ challenge is to remove the post-historic paint and whitewash that subsequent owner’s attempted to cover the markings with, as well as stabilize the fragile plaster. The newly uncovered graffiti was discovered in a crawl space under the stairs, painstakingly revealed by Mills — according to Brandy Station Foundation President Joe McKinney. The name on the wall says Hollingsworth, 11th “something,” McKinney said. After discovering that bit of artwork, Mills and McKinney pondered if more could be hidden in the vicinity. That’s when Mills took out an razor blade and cut out a chunk of modern drywall in the bathroom. Sure enough, under the modern plaster was more Civil War graffiti. McKinney pointed out that the house never ceases to amaze him. “It’s exciting to see there’s still more (graffiti),” McKinney said. It also enhances the learning value of the house. “Going to the bathroom is going to be a learning experience for people,” McKinney said with a chuckle. It’s great that new graffiti has surfaced at the Graffiti House. Wonderful. Don’t we all think so? (Right…) However, let’s closely examine Useless Joe McKinney’s words: “We’re going to have to raise more money,” he says. In other words, BSF’s main (and only) focus is to raise money to find more graffiti that has always been present in the house. It’s always been there, and it always will be there. It’s not going anywhere. Battlefield land however, will disappear if it is developed. Is that not a far more important priority for BSF on which BSF should focus? Nowhere does Useless Joe mention or even suggest that the BSF should be raising money to purchase additional battlefield land. While Useless Joe frets over raising money to find more graffiti in the Graffiti House, there is core battlefield land on and around the Brandy Station Battlefield that is is presently for sale on the open market. Is Useless Joe doing anything to prevent the sale and development of core battlefield land that is situated firmly within the parameters of the battlefield BSF is charged with preserving? No. Not a chance. Preservation of battlefield property is simply not his thing, as he proved so amply during the Lake Troilo episode. It is a fact Joe McKinney is myopically focused on his Graffiti House while battlefield land sits there right now ready for the plucking by somebody. Fine, Joe. Go find your graffiti. But stop calling BSF a battlefield preservation advocacy organization, because you most assuredly are not so listed any longer in that noble category. Change the name of your organization to the Friends of the Graffiti House and stop pretending to be a battlefield preservation organization. 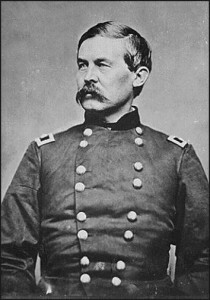 150 years ago today, Maj. Gen. John Buford, the finest cavalryman produced by the Union during the Civil War, died of typhoid fever at the far too-young age of 37. The rigors of so many years of hard marching and fighting had taken their toll on Buford, who had contracted typhoid fever “from fatigue and extreme hardship,” after participating in the marches and fighting during the Mine Run Campaign that on November 7-8 compelled Lee’s Army of Northern Virginia to abandon the line on the Rappahannock River and retire behind the Rapidan River. By November 16, he was quite ill. Buford was granted a leave of absence and removed to Washington, D.C., on November 20, 1863. There he was taken to the home of his good friend, General George Stoneman. Buford’s condition deteriorated quickly, and it soon became apparent that he would not survive. 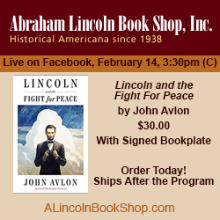 On December 16, 1863, President Lincoln sent a note to Secretary of War Edwin M. Stanton, who was said not to trust anyone with southern antecedents, and who disliked most of the officers associated with John Pope’s Army of Virginia. Lincoln’s note requested that the gravely-ill Buford, whom Lincoln did not expect to survive the day, be promoted to major general. Although the promotion was well deserved, Stanton permitted Buford’s promotion only when it became certain that Buford was dying. The promotion was to be retroactive to July 1. 1863, in tribute to Buford’s service at Gettysburg. “Buford lapsed in and out of delirium, alternately scolding and apologizing to his black servant, who sat weeping by the general’s bed- side. He was comforted by several old comrades, including his aide, Capt. Myles Keogh, and General Stoneman. When the major general’s commission arrived, Buford had a few lucid moments, murmuring, “Too late. . . . Now I wish that I could live.” Keogh helped him sign the necessary forms and signed as a witness, and Capt. A. J. Alexander, 1st U.S., wrote a letter to Stanton for Buford, accepting the promotion. Buford’s last intelligible words–fitting for a career cavalryman–were, “Put guards on all the roads, and don’t let the men run back to the rear.” He died in the arms of his devoted aide and surrogate son, Keogh, on December 16. His master mind and incomparable genius as a cavalry chief, you all know by the dangers through which be has brought you, when enemies surrounded you and destruction seemed inevitable…. The profound anguish which we all feel forbids the use of empty words, which so feebly express his virtues. Let us silently mingle our tears with those of the nation in lamenting the untimely death of this pure and noble man, the devoted and patriotic lover of his country, the soldier without fear and with out reproach. December 20: The army and the country have met with a great loss by the death of . . . Buford. He was decidedly the best cavalry general that we had, and was acknowledged as such in the army. [He was] rough in his exterior, never looking after his own comfort, untiring on the march and in the supervision of all the militia of his command, quiet and unassuming in his manners. In a tribute, the men of the First Division raised money to erect a monument to Buford at his grave site at the U.S. Military Academy at West Point, a fitting final campground for a Regular. Most members of the 9th New York contributed a dollar each to pay for the monument. Had Buford not fallen ill, he would have gone west to assume command of the Cavalry Corps of the Army of the Cumberland. The thoughts of a confrontation between Buford and Nathan Bedford Forrest boggles one’s mind, particularly since Buford’s first cousin Abraham assumed command of one of Forrest’s divisions in early 1864. Alas, it was not to be. And so, we will leave it with the words of Buford’s dear friend, Maj. Gen. John Gibbon, who said, “John Buford was the finest cavalryman I ever saw.” What more needs to be said? At Gettysburg, the Devil gave him a huge debt to pay, but Buford and his troopers did so magnificently. Here’s to Maj. Gen. John Buford, gone far too soon, but most assuredly not forgotten. This excellent, concise article describing the history of the effort to preserve Fleetwood Hill appears in the current issue of Hallowed Ground, the Civil War Trust’s magazine. Thanks to Jim Campi of the Trust for providing me with an electronic version of the article and permission to share it with you. The article can be found here. For decades, the Brandy Station Battlefield lay dormant, almost entirely undisturbed since the epic cavalry battle that erupted in this part of Piedmont Virginia in 1863. It was the largest such engagement ever fought in the Western Hemisphere, with nearly 20,000 troopers clashing sabers, resulting in more than 1,000 casualties. To some, the untouched and pristine piece of America’s past presented an opportunity to preserve the battlefield for future generations; others focused on the development prospects offered by its proximity to prime transportation lines, including a major highway, Norfolk-Southern Railroad and a county airport. After more than a century of silence, a new battle brewed at the pastoral Virginia battlefield — one that ultimately lasted nearly 18 years, pitting out-of-state developers against local preservationists, community leaders and the general public. In the summer of 1987, historians and other activists concerned about the rapid loss of battlefield land formed the Association for the Preservation of Civil War Sites (APCWS) — a precursor to the Civil War Trust. The new organizations came not a moment too soon for Brandy Station. Among those early preservation advocates was former Marine and federal investigator Clark “Bud” Hall, who had spent significant time walking the Brandy Station Battlefield, mapping troop positions, plotting specific points and cultivating close relationships with many local landowners along the way. These friends alerted Hall as their neighbors increasingly began selling their land. Like a line of dominos, a significant portion of farmland comprising the Brandy Station Battlefield fell, piece by piece, into the hands of California real estate investor Lee Sammis. His buying spree signaled to Hall that the hallowed ground was in jeopardy. Hall confronted the developer, who, in an attempt to quell any objections to the ultimate plan for the property, told him it was a family investment intended to be used for farming. Despite these assurances, preservationists could see the writing on the wall: if Brandy Station were to be saved, there would be a struggle. Indeed, Sammis soon announced that his company, Elkwood Downs Limited Partnership, would build a large-scale corporate office park on the Brandy Station Battlefield. 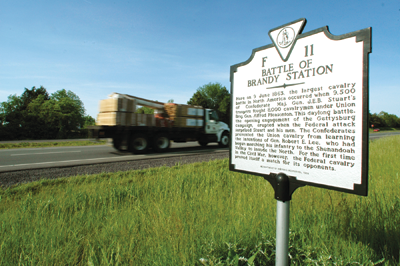 APCWS, concerned citizens, preservationists and local landowners quickly joined forces to create the Brandy Station Foundation in response to the threat. As the coalition gained steam, high-profile names came aboard, specifically Tersh Boasberg, one of the nation’s top preservation attorneys, and Washington lawyer Daniel Rezneck. Their involvement legitimized the organization in the eyes of many by providing much-needed legal footing, thrusting the APCWS and the Brandy Station Foundation — and with them, the modern-day battlefield preservation movement — into the national spotlight. After years of controversy, Elkwood Downs filed for bankruptcy, leaving its development vision unfulfilled. But pause for celebration was brief. New developers targeted the hallowed ground as an ideal site for a Formula One racetrack and proposed plans to build on 515 acres of the battlefield, a construction project of such magnitude that it would have meant complete destruction of the historic land. Preservationists mobilized to begin fighting the racetrack, but providence struck first — insufficient planning and lacking infrastructure forced the developer to declare bankruptcy and abandon its plans. After two close calls, the coalition of preservationists acted quickly to ensure the preservation of the battlefield by purchasing the property. Ultimately, and at a cost of more than $6 million, APCWS bought 944 acres from Sammis in 1997. The acquisition was a huge step forward in preserving the battlefield, but the process was far from complete and much more historically significant land remained to be saved. But, as is often the case, success bred success and, gradually, more properties were added. A particular highlight of the preservation process came in 2003, the 140th anniversary of the battle, when the Civil War Trust and the Brandy Station Foundation unveiled the Brandy Station Battlefield Park, comprised of interpretive signage, hiking trails and a driving tour. By the end of 2012, on the eve of Brandy Station’s sesquicentennial year, the Trust and its partners had protected more than 1,800 acres of the battlefield through outright purchase and conservation easement, making it one of the organization’s greatest success stories. Still, something was missing. Despite having made several overtures over the years, Trust officials had been unable to make any inroads toward securing the battlefield’s most visible feature, the heights of Fleetwood Hill — the crest of which was occupied by a pair of large, modern homes. Nonetheless, periodic discussions with the landowners continued until, eventually, a breakthrough occurred. 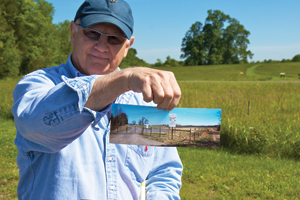 In May 2013, the Trust kicked off a $3.6 million campaign to purchase 56 critical acres atop Fleetwood Hill. With such a lofty goal before it, the entire preservation community rallied behind the Civil War Trust in its quest to purchase the property. Particularly notable contributions — both financial and logistical — came from partner groups the Central Virginia Battlefields Trust, the Journey Through Hallowed Ground and the Brandy Station Foundation, as well as from numerous private citizens. Generous matching grants from the federal American Battlefield Protection Program and the Virginia Civil War Sites Preservation Fund were also instrumental in securing the full purchase price of the property to complete the transaction in August 2013. The second photo is of Clark B. “Bud” Hall holding a photo of the “for sale” sign that stood on Fleetwood Hill until the Trust purchase the property. The first photo stands along Rt. 15/29 adjacent to Fleetwood Hill. This article explains why we fought so hard to save Fleetwood Hill. We could not have done so without the generosity of so many people who gave so much to permit us to be able to save that ground. Our work at Brandy Station is not finished yet, and we continue to fight to preserve pieces of that beautiful battlefield. But it’s been a great story made possible by a lot of hard work by a lot of people. I, for one, am grateful for it.